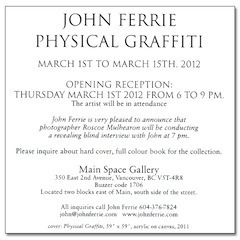 “Physical Graffiti” is my most recent gallery exhibit. Graffiti describes images or lettering scratched, scrawled, painted or marked in any manner on property. It is any type of public marking that may appear in the forms of simple written words to elaborate wall paintings. The bright, bold imagery of graffiti is used to make the viewer sit up and take notice of the message. Often associated with delinquent and degenerate youth, graffiti may also express underlying social and political messages, and has become recognized as an art form unto itself. Vancouver once boasted 18,000 neons signs. These signs not only advertised businesses, they lit up the streets, giving a unique glow to the rain, with the lights visible to passing aircraft. These signs were creative, fanciful and pulsed with life. This vibrancy speaks to my vocabulary as an artist. When I am contemplating the message of a new collection, colour is always the most expressive element. The vintage neon signage chosen for this collection have often been rescued from obscurity and destruction. Some have heritage designation, while others are rusting and crumbling into oblivion. For the first time in my career, my technical approach was a flat black gessoed canvas. Painting on black truly made the colours have an intensity akin to illumination. The works are acrylic paint and KRINK markers. Whimsy and character meld, and as you examine each piece closer, more is revealed, much like a fractal. “Physical Graffiti” is yet another version of this incredible and vibrant city that I love. It is all part of the 10,000 hours. Dedicated to my loving partner, Will. Thank you for “pausing” when I needed it most.